The fate and transport of oil droplets from natural and anthropogenic sources is key to understanding the impact of spills and the resilience of marine communities. Without knowledge of natural background levels, it is difficult to determine the response of the marine environment to large influxes of oil. Current estimates of global flux of oil from natural seeps varies by an order of magnitude, and the wide range of estimates is due in part to the lack of sufficient in situ quantification techniques for oil droplets in the water column. 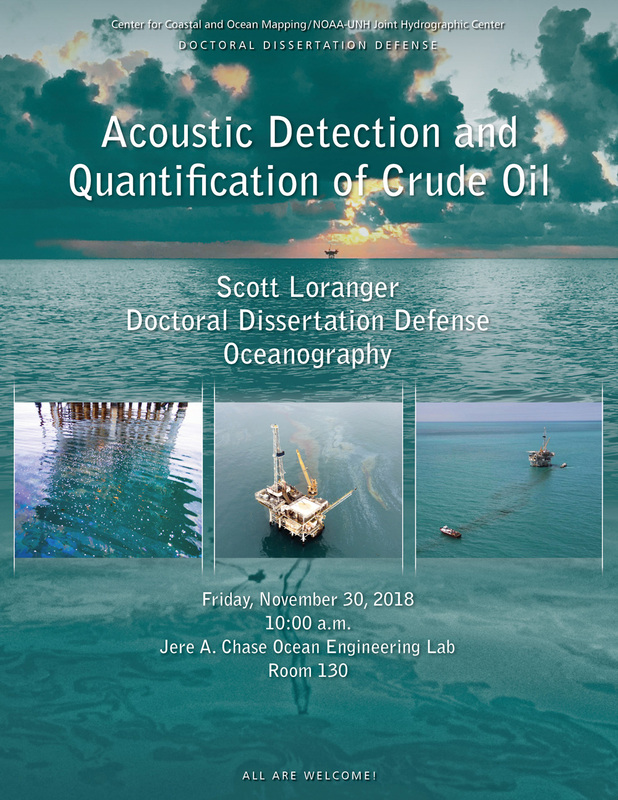 My Ph.D. dissertation is focused on the feasibility of employing broadband acoustics to address this gap by developing a better understanding of the interaction between sound generated by broadband acoustics and oil droplets in the ocean. The dissertation is organized into three experiments, each written into a manuscript for peer-reviewed publication. The first addresses the paucity of data at oceanographically-relevant pressures and temperatures regarding the physical properties of crude oil that determine acoustic scattering. The acoustic impedance of four crude oils was measured under oceanographic conditions using a sound speed chamber designed and constructed for this experiment. Measurements showed significant deviations from an often-used empirical model and a new empirical model was developed. The results of the first experiment were used in the analysis of the second study. High frequency broadband acoustic backscatter was recorded from droplets of three different crude oils of varying size and shape and compared to three scattering models for fluid targets. The results highlighted the importance of droplet shape (i.e., deviations from a perfect sphere) in acoustic backscatter observations of crude oil droplets. The first two experiments were used to inform the analysis of the third experiment. Broadband acoustics along with ADCP measurements were used to determine flux at an anthropogenic seafloor release of oil and gas. Results of this thesis indicate that broadband acoustics are capable of quantifying oil droplets and oil flux. Scott Loranger received his B.S. in Marine Biology from Cornell University in 2009. Before joining the CCOM/JHC, he was a technical coordinator for the Alliance for Coastal Technologies and a research assistant for the Smithsonian Tropical Research Institute. As a Ph.D. student in Oceanography, he is interested in acoustical oceanography and underwater acoustics, focusing on acoustic methods for the detection and quantification of weak scatterers in the water column. His thesis is focused on developing acoustic methodologies for the detecting and quantification of oil in the marine environment.